Stop press: Tates Travel are no longer trading and the 96 is no longer running. This post has been left on in case another company starts running that route. Always check with the operator and local authority before you travel. The 96 links a town and a city in Yorkshire via a few commuter villages and a real gem of a tourist attraction. Prepare to be pleasantly surprised! 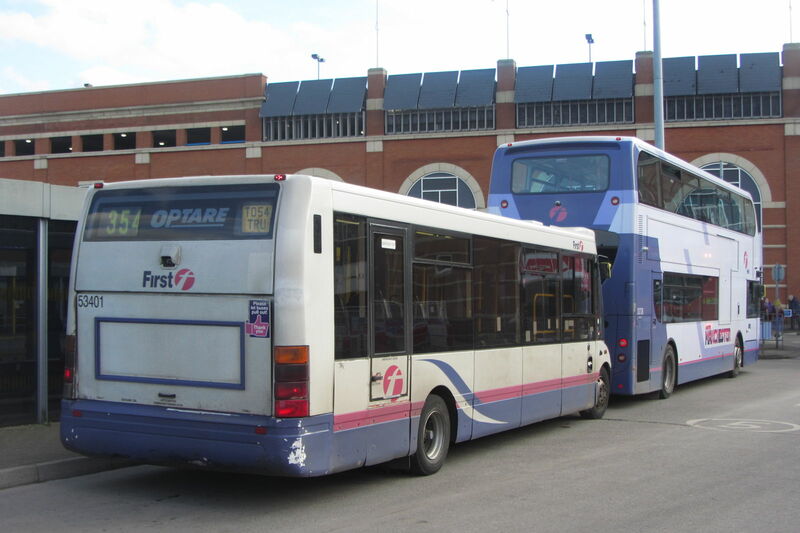 Click here to discover other bus routes in Yorkshire. Once a mining town, Barnsley has now been regenerated with plenty of flowers in the town centre and possibly Britain's most modern-looking bus station. It's so easy to use Barnsley as a hub because the bus and railway stations are right next to each other. There was me thinking that such sensible ideas had been banned in the UK! Things to do in Barnsley include the Museum & Discovery Centre and Calypso Cove Water Park. The highlight of this route by far. There's nowhere like Yorkshire Sculpture Park anywhere else in Britain. Huge sculptures, lots of them, set in an enormous country park. You really need to spend the whole day here to do it justice. Great value too: car drivers get charged £7.50 to park, but bus passengers don't have to pay a penny! The bus runs right into the park, dropping you off in the car park by the visitor centre, which includes a gift shop and toilets. Elsewhere in the park there are a restaurant and cafe although you can of course bring your own lunch and have a picnic. Wakefield became a city in 1888. There's plenty to do including a visit to Wakefield Cathedral or Sandal Castle. The only day ticket valid from end to end is the operator's own Tates Travel Day Saver at £4.40. For single and return fares, call Tates on 01226 205 800. If you are travelling only within West Yorkshire, so Wakefield to Yorkshire Sculpture Park, then you can use Metro's range of tickets. The MetroDay at £5.40 can be used on all buses of all operators throughout West Yorkshire. If arriving by train, a Wakefield Plusbus ticket has the same validity as the MetroDay. If you are only travelling within South Yorkshire, that's Barnsley to Haigh Roundabout (M1 junction 38), then you can use Travel South Yorkshire's tickets, which include the SYConnectDay at £6.00, valid on all buses in South Yorkshire. While valid on the 96, these tickets cannot be bought on board the bus, but are available from the Travel South Yorkshire Information Centre at Barnsley Interchange. If arriving in to Barnsley by train, the Barnsley Plusbus has the same validity as the SYConnectDay. 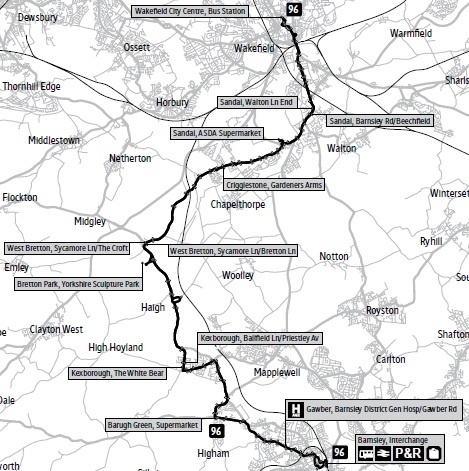 Map of the 96 and major connecting routes. Not to scale. Red routes are operated by Tates Travel and can be used with their Day Saver. Green routes are run by other companies. Travel South Yorkshire have a map of all bus services in Barnsley. Stagecoach run most of the buses in Barnsley (but not the 96). See a map of their Barnsley routes here. Barnsley's bus and railway stations are all under one roof at Barnsley Interchange making switching from train to bus and back again easy. Click for live train departures, departure list and fares. If you're connecting in Wakefield, then Metro's Wakefield bus map will help you on your way. See the detailed city centre map here and bus station details here. Arriva run most of the buses in Wakefield. See their local network map here. Westgate: Click for live train departures, departure list and fares. Kirkgate: Click for live train departures, departure list and fares. I took this bus last Sunday and visited the sculpture park. It was a great day. Thanks for all your hard work, much appreciated and very informative.